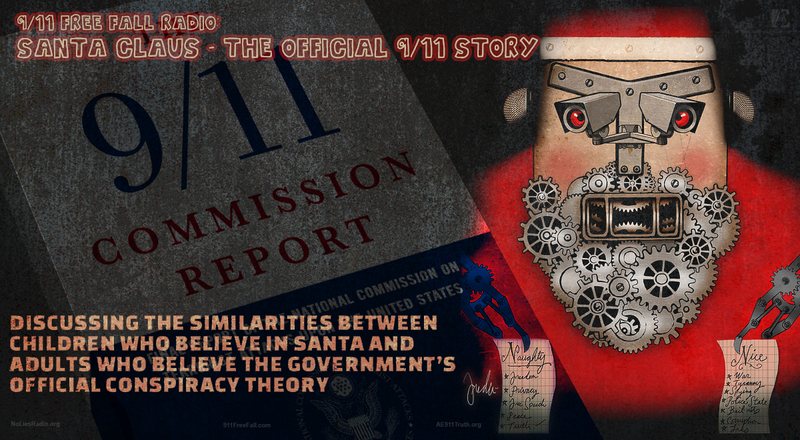 In this special 2014 Christmas day encore episode of 9/11 Free Fall Andy Steele discusses the holiday and the similarities between children who believe in Santa Claus and adults who believe in the government’s explanation of what happened to the three WTC towers that fell on 9/11. He also discusses the Senate Intelligence Committee report on CIA torture and the public’s acceptance of torture as a result of the official 9/11 lie, as well as what constitutes evidence when it comes to 9/11 Truth and what doesn’t. This entry was posted on Wednesday, December 27th, 2017 at 9:52 pm	and is filed under 9/11, 911 Free Fall, Censorship-Propaganda, False Flag/Fake Terror, Freedom, Justice, News, Protest. You can follow any responses to this entry through the RSS 2.0 feed.